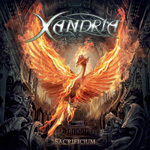 Long serving symphonic power metal band Xandria returns with their sixth studio album, Sacrificium, along with a new singer, Dutch vocalist Dianne van Giersbergen (Ex Libris). Like the the album, Giersbergen is the sixth vocalist for the band in it's 20 years of existence. If you like your vocals on the more operatic side, you'll like this gal. Being a female-fronted symphonic metal band you either have to go big or go home. There's no middle ground. Once more, from start, Xandria pulls out all the stops with the epic and bombastic title track. Like many songs here the orchestration is large, the vocals soaring. The Undiscovered Land repeats the formula, offering some folk nuance and Giersbergen's vocals lilting like a butterfly over the more gentle parts. Mostly, though, she's off the ground testing her multi-octave range, which make it difficult to understand anything she's singing. Keep your lyric sheet handy. While the symphonic side never really gets a rest, it does, at times, get backed down in favor of more heavy power metal as with Betrayer and Dreamkeeper. Come With Me does much the same, but also has a nice rock groove to propel it. Later, Temple of Hate has a darker feel, with riffage thicker and controlling the song more so than the orchestration. The last song, Sweet Atonement, is the lightest here offering Giersbergen over a light piano and symphonic layer. Other strong points include some sharp guitar solos and the simple fact that, unlike other bands in the genre, there are no male death vocals. Yes. Much like the previous Neverworld's End, this album fits the band and fans will not be disappointed one bit. With over an hour's worth of music, you get a lot of bombasitic bang for your buck. Recommended. Sacrificium arrives with a new singer, but the same direction for Xandria: epic and bombastic symphonic power metal to blow up your speakers.